On Thursday night, the Cleveland Cavaliers will be in Chicago for Game 6 of the Eastern Conference semifinals. Win, and they move on. Lose, and they’ll be forced to endure a winner-take-all Game 7 on Sunday at Quicken Loans Arena. It really is that simple. And yet, that’s not the only thing simple about this particular series. Here’s something even less difficult to understand: LeBron James is good. LeBron James is really really good. And sometimes we take that for granted. If you weren’t able to watch Game 5 (on Tuesday night) of this matchup, please tell us you were able to catch the highlights. If you missed out on both of these things, then we feel bad for you. 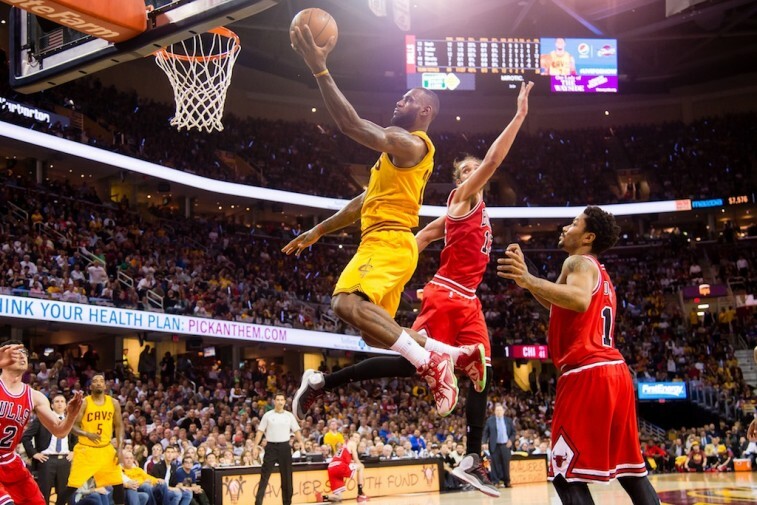 In the Cavs’ 106-101 victory, the King was magnificent — he really was. The sad part is, he has to be. ‘Bron can’t have an off game at this point; not if he wishes to make it back to the finals for the fifth consecutive season. Under these particular circumstances, he doesn’t have that luxury. James knew the road back to the NBA Finals would be difficult, but there’s no way he could’ve predicted just how challenging this season would be; how challenging this particular postseason would be. The Cavaliers are hurting and this team is not known for its depth. If Cleveland had the right bodies available, it wouldn’t need Kyrie Irving, in Game 5, to suffer through 39 minutes on two messed up legs. But he’s a warrior who delivered 25 points on 9 for 16 shooting. Hats off to the young point guard for his gutsy performance. His team needed that. But as always, the Cavs needed No. 23 more. He knew that — his historic performance was proof enough. James had one of those showings that people will talk about for years to come. He was aggressive and determined and dominant in all facets of the game. When the final buzzer sounded and the Cavaliers had wrestled away control of the series, the team’s star had a stat line that forced one to do a double take. He finished the night with 38 points, 12 rebounds, 6 assists, 3 steals, and 3 blocks. Players aren’t supposed to put up numbers like that; especially players who had severely rolled their ankle the game before. In the history of the NBA playoffs, only six players — Paul Pierce, Gary Payton, Hakeem Olajuwon, Charles Barkley, Larry Bird, Michael Jordan — in the past 30 years (including James) have had a game with at least 35 points, 10 rebounds, 6 assists and 3 steals. And yet, by having more than one block on the night, James still manages to distinguish himself from the pack. But if you thought this was the only historical accomplishment achieved by the Cavs’ superstar on this night, you’d be sadly mistaken. Prior to this contest, James had scored 30 points, 5 rebounds, and 5 assists in 50 separate playoff games. The only person to best that feat, used to wear No. 23 for the Bulls — MJ did it 51 times. After Tuesday’s affair, James and Jordan, again, share more than just a jersey number. ‘Bron’s spectacular performance was his 51st game with these particular figures. We think one of these days he’ll stand alone at the top of this this. 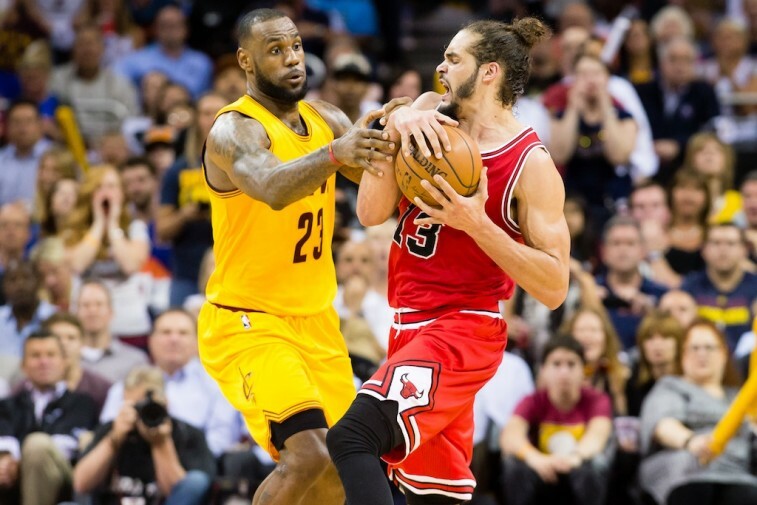 Everyone knew this Cavaliers-Bulls series was going to be a slugfest. When these two clubs get together, they battle. And you’re not going to win if your stars don’t come to play. The Bulls have gotten great performances from Derrick Rose and Jimmy Butler. But Cleveland has LeBron James. And he’s been better than great — he’s been historic. It’s no wonder the Cavaliers are one win away from the conference finals.